Although the 2013 MLB Amateur Draft will not compare to past drafts in terms of overall talent, the strength of pitching (especially that of college pitching) will sustain the June 6th draft. 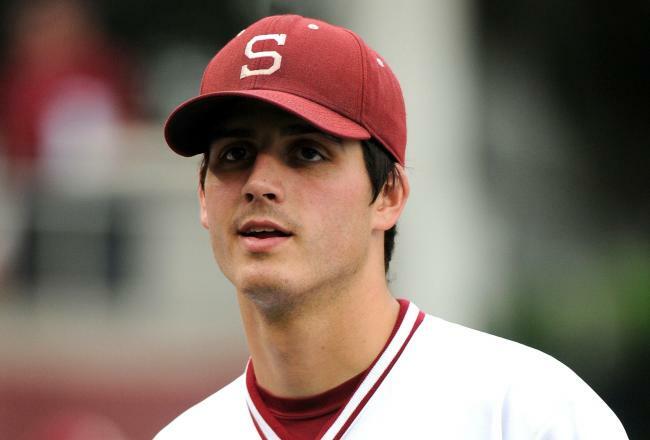 Stanford University’s Mark Appel and the University of Oklahoma’s Jonathan Gray have separated themselves from the rest of the draft pitching crop, placing themselves on an elite tier and garnering top pick projections from analysts and scouts across the country. Following close behind are a number of talented high school and college pitchers who are projected to be selected in the first-round of the draft. Appel returned to Stanford this spring and has pitched phenomenally, becoming one of the frontrunners for first-overall pick for the second straight season. Appel has a clean, smooth delivery that can be easily repeated due to solid mechanics and a strong repertoire of pitches that appear to be much sharper this season. He boasts a mid-90s fastball that he commands with plus movement, a slider that has good downward movement, and a circle changeup that has developed into a plus off-speed offering. There is not much to criticize in regards to Appel’s approach and command of pitches, as his broad arsenal, control, mechanics, and mound presence indicate that he will be a future front of the rotation starter. Coming into the 2013 season, Dillon Overton was projected to be the ace of the Oklahoma staff; however, Gray had other projections, rising to national prominence as one of the top pitching prospects in the country. Gray has a balanced, smooth delivery that is highlighted by long leg strides that allow for exceptional pitch velocity and movement. Gray’s pitch arsenal is diverse, highlighted by a plus fastball that consistently sits in the high-90s with explosive movement and control. A powerful slider has served as a solid out-pitch this spring, which he can paint the strike zone with plus control and movement. Although he needs to work on the strength of his arsenal, Gray projects to be a front of the rotation starter who can eat innings and maintain control deep into starts. Stewart is the top high school pitching prospect in the draft, displaying great projection and polished pure stuff. Although Stewart has a questionable delivery, as he uses of lot of upper body movement rather than his legs and tends to throw the ball rather than “pitch,” Stewart’s excellent repertoire of pitches more than makes up. His repertoire is highlighted by a mid-90s fastball with good movement and a plus slider than he uses to attack the strike zone and baffle hitters. His off-speed offerings are solid as well, working in an occasional curveball and changeup. Stewart’s excellent arm strength and speed can be attributed to the fact he is one of the top football prospects in the country. Provided he is developed through a patient system, Stewart projects to be a future front of the rotation starter. Shipley has come on strong in recent weeks with a strong spring for Nevada, displaying his pure stuff and potential projection to intrigued big league clubs. Shipley has a clean delivery with sound movement, highlighted by rapid and strong arm movement that produces effective control. Despite needed improvements to his mechanics and curveball, Shipley has a broad arsenal of pitches that is highlighted by a plus fastball that sits in the mid-90s consistently and explodes in the zone with quick movement. A solid changeup with good sinking movement and fade is complimented by a curveball that serves as a good off-speed offering. Stewart is mature and has polished stuff, and with proper development is projected to be a future number two starter. Coming into the 2013 season, Stanek was considered one of, if not the top arm in college baseball; however, an inconsistent start to the season hurt his draft stock significantly. Although Stanek has rebounded as of late and still remains one of the top arms in the draft, many scouts are concerned with his delivery that requires a decent amount of effort, which may relegate him to the bullpen in the future. Stanek boasts one of the strongest arms in the draft, which bodes well for his plus fastball that sits in the mid-90s, maintaining consistent velocity and solid sinking action. His slider and changeup have good life and have been shown to be plus pitches at times this season. With consistency and further development, Stanek projects to be a future top of the rotation arm (most likely number two starter). Manaea lit up the Cape Cod League this past summer and quickly garnered attention as one of the top arms in college baseball. Manaea has a quick moving delivery highlighted by long leg strides, allowing for added life on his pitches. The strong-armed southpaw commands a mid-90s fastball that has plus movement and slider-curveball combo that he aggressively pitches with hard action and solid break. Despite injuries to his hip and shoulder and inconsistent play this spring, if Manaea is able to recapture his electric spark from last summer and remain healthy during his development in a club’s system, he can become a solid front of the rotation starter. Ball is one of the better all-around players in the draft, having served as a pitcher and outfielder in high school. Touted more so as a pitcher, Ball owns a delivery that is clean and relatively sound, though he has been more of a thrower than a pitcher due to his commitments to both offense and pitching. Ball has a good, wiry frame (that he will most likely grow into) that allows for him to add extra movement to a plus fastball that sits in the low to mid-90s. Ball compliments his heater with a solid off-speed arsenal headlined by a changeup and curveball, which have developed into strong secondary pitches. Not many southpaws have the strength and trajectory as Ball, in that his pure stuff will allow him to become a stout middle rotation starter in the future. Gonzales has been one of the most consistent and successful pitchers in college baseball over the past two seasons, serving as the ace of the Gonzaga staff. In terms of polish and plus-projection, Gonzales is one of the best arms in the draft, as his advanced approach and ability will allow for him to make a quick transition to the big leagues. While he does not possess a big arm, Gonzales boasts a broad, solid pitch arsenal based around off-speed offerings. Gonzales commands a good fastball that sits in the high-80s to low-90s and utilizes a slider that has effective movement. His primary out-pitch is his plus changeup, which he commands with great location and fade, baffling hitters. Although he does not have a large stature and his velocity is not blazing, Gonzales should move quickly through the minors and become a solid middle rotation starter. After throwing a no-hitter against Bethune-Cookman in the Gainesville Super Regionals last season, Crawford gained national attention for his performance and became recognized as one of the top pitchers in college baseball. Although he has the tendency to throw many of his pitches rather hard, Crawford has a strong pitch arsenal that is centered on his strong arm and delivery. Crawford boasts a mid-90s fastball that maintains its velocity deep into starts and has electric movement. His signature pitch is his plus slider, considered to be one of the best in college baseball, which explodes in the zone with great movement, baffling hitters. Crawford utilizes off-speed offerings such as a changeup with good fade and hard action and a curveball that has developed strongly since last season. Despite inconsistencies with command this season, Crawford’s pure stuff and trajectory will allow him (given effective development in the minors) to become a future middle of the rotation starter. Clarkin is one of, if not the top left-handed high school pitcher in the draft who has displayed plus raw talent over his past two seasons. He has a smooth, yet strong delivery that he effectively utilizes to give hard action to both his fastball, which sits in the low to mid-90s with authority, and curveball, considered to be one of the best in high school baseball. He offers a solid overall pitch arsenal, which has been strengthened with the development of his off-speed pitch offerings, such as his changeup. Clarkin struggled with command last summer, but has righted that ship for the most part, which in accordance with his left-handed raw skills will allow for him to become an effective middle of the rotation starter in the future.